Researchers at Rensselaer Polytechnic Institute have developed a new, ultra-simple method for making layers of gold that measure only billionths of a meter thick. The process, which requires no sophisticated equipment and works on nearly any surface including silicon wafers, could have important implications for nanoelectronics and semiconductor manufacturing. Sang-Kee Eah, assistant professor in the Department of Physics, Applied Physics, and Astronomy at Rensselaer, and graduate student Matthew N. Martin infused liquid toluene - a common industrial solvent - with gold nanoparticles. The nanoparticles form a flat, closely packed layer of gold on the surface of the liquid where it meets air. By putting a droplet of this gold-infused liquid on a surface, and waiting for the toluene to evaporate, the researchers were able to successfully coat many different surfaces - including a 3-inch silicon wafer - with a monolayer of gold nanoparticles. "There has been tremendous progress in recent years in the chemical syntheses of colloidal nanoparticles. However, fabricating a monolayer film of nanoparticles that is spatially uniform at all length scales - from nanometers to millimeters - still proves to be quite a challenge," Eah said. "We hope our new ultra-simple method for creating monolayers will inspire the imagination of other scientists and engineers for ever-widening applications of gold nanoparticles." Monolayer films of gold nanoparticles can be fabricated using a toluene droplet without using any sophisticated instruments. Synthesis of dodecanethiolate-protected gold nanoparticles is fast, reproducible, and 1 nm size-tunable without any post-synthesis cleaning. Results of the study, titled "Charged gold nanoparticles in non-polar solvents: 10-min synthesis and 2-D self-assembly," were published recently in the journal Langmuir. Whereas other synthesis methods take several hours, this new method chemically synthesizes gold nanoparticles in only 10 minutes without the need for any post-synthesis cleaning, Eah said. In addition, gold nanoparticles created this way have the special property of being charged on non-polar solvents for 2-D self-assembly. Previously, the 2-D self-assembly of gold nanoparticles in a toluene droplet was reported with excess ligands, which slows down and complicates the self-assembly process. This required the non-volatile excess ligands to be removed in a vacuum. In contrast, Eah's new method ensures that gold nanoparticles float to the surface of the toluene drop in less than one second, without the need for a vacuum. It then takes only a few minutes for the toluene droplet to evaporate and leave behind the gold monoloayer. "The extension of this droplet 2-D self-assembly method to other kinds of nanoparticles, such as magnetic and semiconducting particles, is challenging but holds much potential," Eah said. "Monolayer films of magnetic nanoparticles, for instance, are important for magnetic data storage applications. Our new method may be able to help inform new and exciting applications." The simplest solutions are often the most elegant. Good job! This was developed quite a while ago, as we were using this method last semester to coat our superconducting samples for flux pinning. Interesting to see it on here without a similar application. I feel like this article is leaving quite a bit out. From reading the abstract of the actual paper it seems that they first disperse charged gold nanoparticles in hexane. They then mix a small hexane droplet with a larger toluene droplet. The gold nanoparticles then float to the toluene/air interface and form a monolayer which is deposited on the surface after the hexane and toluene evaporate. 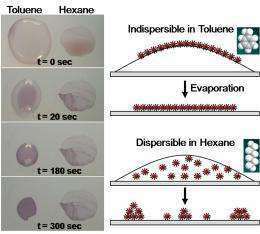 Pretty cool way of getting a uniform layer on the surface of the toluene.